From the lake palaces on Pichola Lake to the houseboats along picturesque Dal Lake, our trip to India never ceases to amaze us with what this country had to offer. For our second leg of the trip to India, we flew from Udaipur to New Delhi for an overnight stay before flying to Srinagar in the state of Jammu-Kashmir. Yes – you read correctly – Kashmir! Most of us know this place as the conflict-ridden zone between Pakistan and India but that’s the old Kashmir – the conflict had stopped for quite a number of years now and Srinagar is becoming one of the most popular tourist destination in India. Srinagar had been nicknamed ‘Venice of the East’ or ‘Kashmiri Venice’ because of its beautiful lakes – Dal Lake and Nagin Lake – the former being more commonly associated with houseboats. 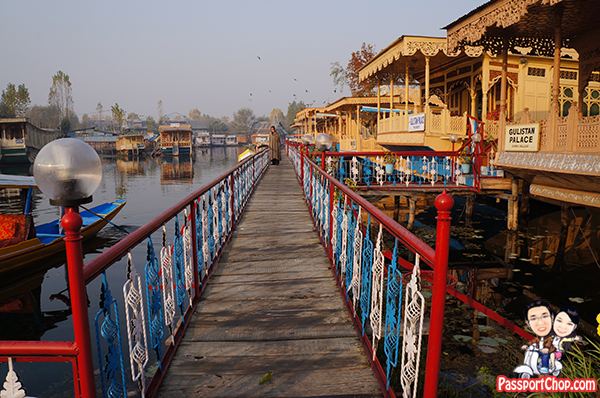 These houseboats are generally made from local cedar-wood and measure 24–38 metres in length and 3–6 metres in width and are graded by the Jammu-Kashmir tourism office in a similar fashion to hotels according to level of comfort – with the most comfortable grade being “Deluxe class” and it goes down from “A class” to “B class” to “C class” to the most basic “D class” houseboats. Some houseboats have even gone further to classify themselves as “Super Deluxe class”. A luxury “Deluxe class” houseboat has fine furniture, good carpets and modern bathroom fittings, while the lowest category “D class” of houseboats is spartanly furnished like no-frills budget hotels. The difference in price between a “Deluxe class” and “D class” houseboat per night is about 3000 rupees (or about 68 Singapore dollars) – assuming full board (breakfast, lunch, afternoon tea, dinner included). During our stay at Srinagar, we stayed at the Deluxe class Bostan houseboat – part of the Bostan-Gulistan group of houseboats owned by Mr Ashraf Guru – interestingly, Singaporeans and Malaysians make up a large proportion of Ashraf’s guests which probably explains the small Merlion statue in the houseboat’s souvenir cabinet and very familiar-looking packs of Milo and instant noodles at the pantry (most likely brought here and left there by Singaporeans). You cannot drive to Bostan Gulistan houseboats – these houseboats are accessible only via the houseboat’s 2 shikaras. A shikara is small taxi boat operated manually by a boatman with his paddle. It is about 15 feet (4.6 m) long and made of wood with a canopy and a spade shaped bottom. It is the cultural symbol of Kashmir and is used not only for ferrying visitors but is also for a myriad of usage e.g. peddling goods in the market. A shikara can seat about six people (or 4 people with luggages) and have heavily cushioned seats and comfortable backrests. The shikara ride from the jetty on the other bank of Dal Lake to the Bostan Gulistan houseboats is included with your houseboat stay – just make sure you board only your houseboats’ shikaras. Cruising along Dal Lake, you can get a great view of the houseboats lined up along the lake – some of these houseboats have rather interesting sounding names from the New Manhattan, the New Buckingham Palace, Paris and other well-known cities around the world – there are some obvious trademark infringement with some famous hotel brand names e.g. Hilton – don’t be mistaken though – there isn’t a Hilton setup in Srinagar at this time yet. These houseboats share a common interesting history – during the colonial times, the British enjoyed coming to Kashmir due to the great climate but there were not allowed to purchase land and build their summer houses at Kashmir. 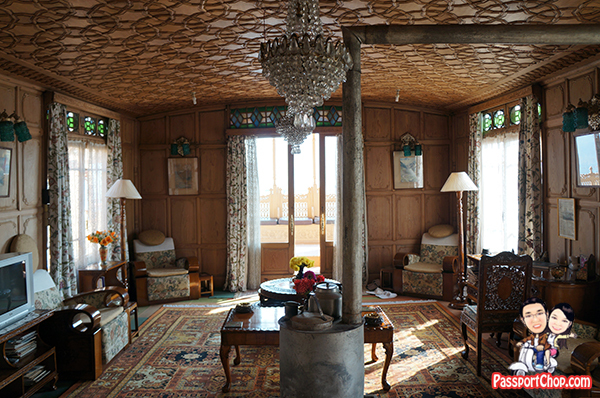 However, the Kashmiri maharajah at that time allowed them to stay on houseboats on the lakes and rivers – thus this resulted in a growth spurt of luxurious houseboats around Dal Lake – the British being British had wanted to live in style at Kashmir and no expenses were spared in making them as luxurious and comfortable as possible. Thus the reason for some of the “Deluxe class” houseboats. Some of these houseboats boast a front verandah, a luxurious living room, an elegant dining room, three to four luxurious bedrooms with attached bathrooms and an upper sun deck. These houseboats are mainly permanently moored along the western periphery of Dal Lake. They are anchored individually, with interconnecting bridges providing access from one boat to the other. Made completely of wood by craftsmen, the oblong houseboats feature intricately carved wood, often in a lattice pattern. The Bostan houseboat that we stayed in even boasted carved walnut furniture, Kashmiri carpets, embroidered soft furnishings, chandeliers and other luxurious fittings like a floating jewel box. While the Bostan houseboat is of “Deluxe class”, you will have to understand that you are still staying on a houseboat in India – the amenities will not in anyway rival Leela Palace Udaipur. 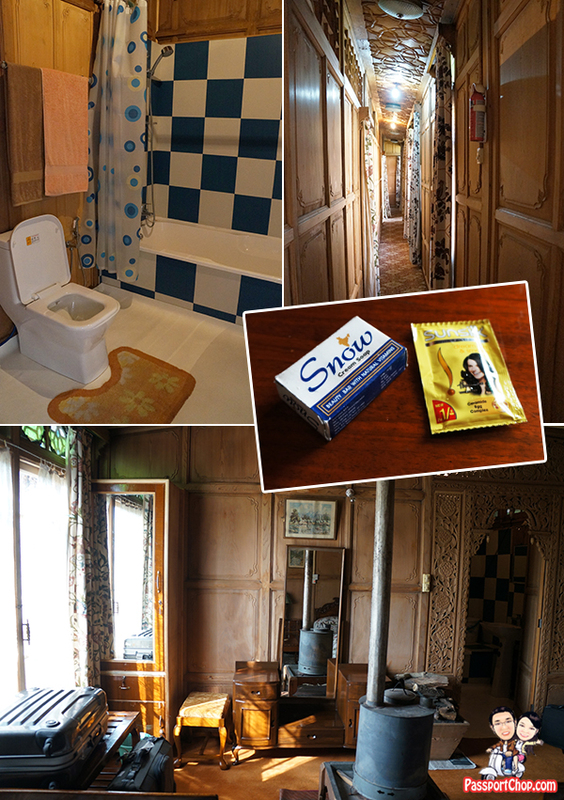 Running water and full-functioning bathrooms are standard amenities provided but don’t expect luxurious rainshower facilities and fancy toiletries – you get a small bar of soap and pack of shampoo. Blackouts are quite common but you will not be walking about in complete darkness as essential lights are powered by a backup generator – thankfully Bostan houseboat consider Wi-Fi an essential service so you can still check your emails and upload your photos and talk to your friends and family via Skype even during an electricity blackout. It can get really really cold at night and in the morning in Srinagar – thankfully Bostan houseboat’s beds are equipped with electric heated blanket (but the power to this heated blanket will be cut off during a blackout). The blankets itself are quite thick even with the electric heater turned on. 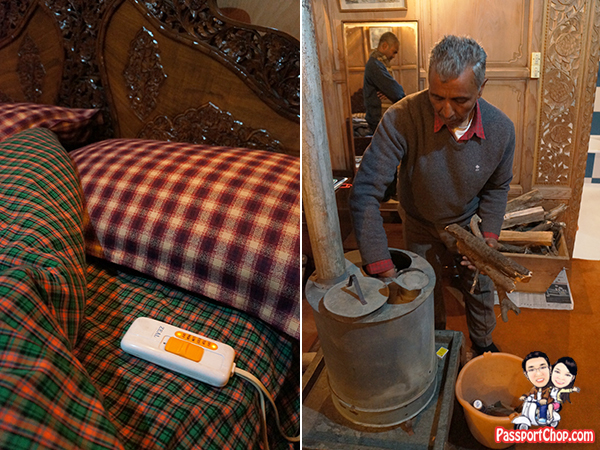 In addition to the blankets, we had requested for our Bostan houseboat butler Abdul to setup the heater stove every night and every morning – ask for the fire to be setup an hour or two before you sleep because the kerosene smell (during the initial fire start-up) can be quite heavy. Most houseboats provide home-cooked meals as part of the houseboat stay package – do note the tariffs/room charge for different package – E.P usually refer to room rate just for the room; C.P refers to room plus breakfast; M.A.P refers to room with breakfast and dinner; A.P refers to full board (room with breakfast, lunch and dinner). For A.P, some houseboats include bed tea (which I assume is a cup of tea before you sleep) and afternoon tea. 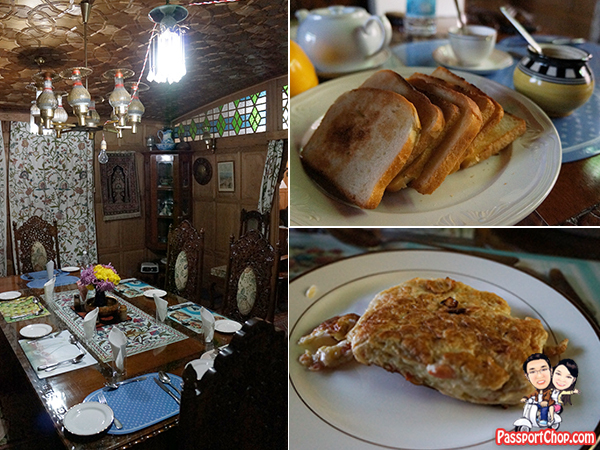 At Bostan Houseboat, you can make requests with Abdul on what you would like to have for breakfast – the Masala omelette is a must-try – apparently they can prepare any food you request (as long as they have the ingredients) so you can try ordering pancakes, waffles and even porridge. The standard fare for breakfast include oatmeal, coffee or tea and toasted bread with jam. For dinner, we enjoyed a feast of Kashmiri home-cooked chicken and lamb plus a stew of spiced vegetables with rice. 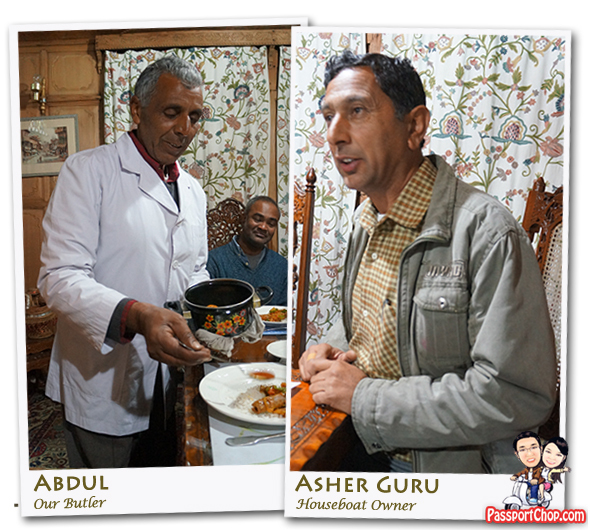 If you have the time – do spend some time interacting with Mr Ashraf Guru and find out about the interesting history of houseboats in Srinagar. Abdul, our butler does not talk a lot but he is very efficient and effective in ensuring your needs are met – he reminds me of the strict British butler that we usually see in movies – quiet and efficient in getting things done behind the scene – perhaps he had some experience serving with the British when they were staying in the houseboats in Srinagar? Jet Airways flies to Srinagar from New Delhi twice a day. 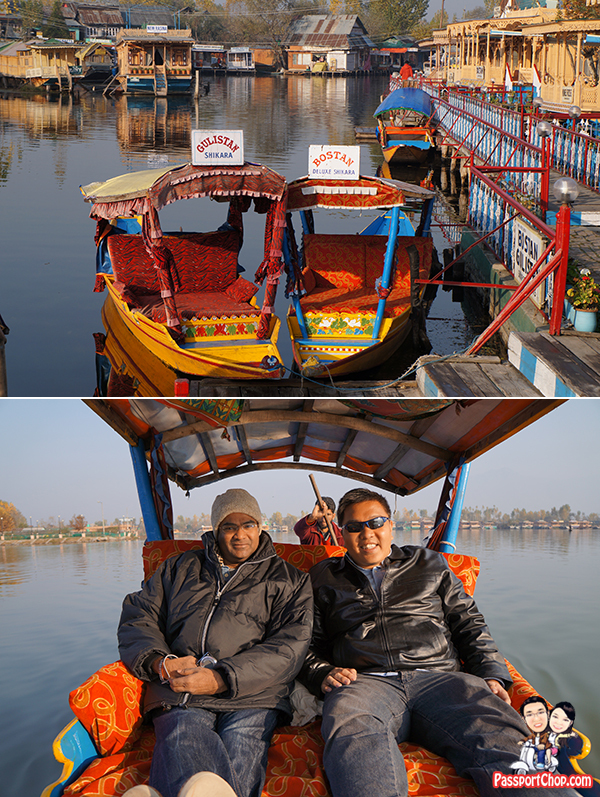 If you want to experience deluxe houseboat living like a along Dal Lake, I strongly recommend the Bostan-Gulistan group of houseboats owned by Mr Ashraf Guru as your houseboat of choice during your stay at Srinagar because of the friendly and efficient service of Ashraf and Abdul as well as delicious home-cooked breakfast and dinner.